Tiny Belly-Lip Orchid is an epiphytic orchid found in the Himalayas, east till Assam, at elevations of 200-700 m. The generic name Gastrochilus means 'belly lip'. 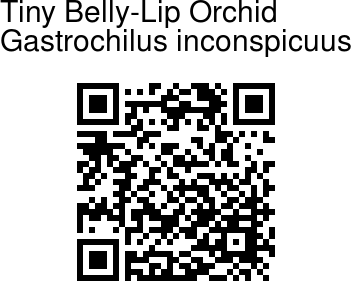 This name was coined by the Scottish botanist David Don in 1825 due to the fact the lip looks blown up like a beer belly. It has a round, flexuous stem enveloped by red-brown leafless sheaths below and above. The stem carries straight to weakly curved, rugose-striate, dark green, stalkless leaves. 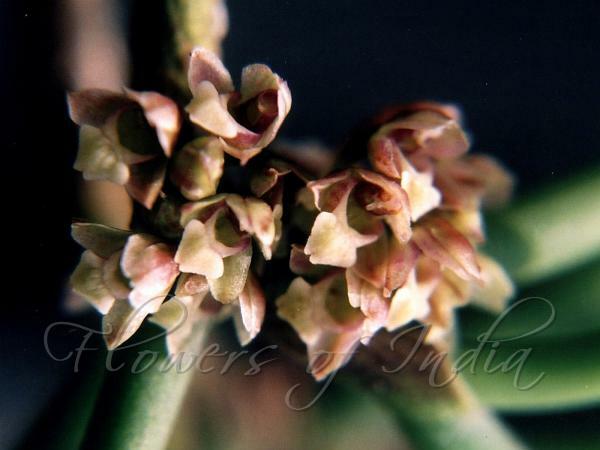 The plant blooms in the late spring and early summer on various lateral, raceme-like, 1 to 4 flowered clusters, up to 2 cm long. Identification credit: Pankaj Kumar Photographed in Ranchi, Jharkhand.